Spacewalkers Mike Foreman (right) and Robert Satcher, Jr. work on the exterior of the International Space Station during the first spacewalk of the STS-129 mission on Nov.19, 2009. Thisstory was updated at 6:20 p.m. EST. Twoastronauts breezed through the first spacewalk of their mission Thursday asthey upgraded the International Space Station with a spare antenna and othergear. 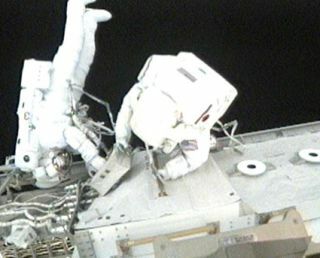 Atlantisshuttle astronauts Mike Foreman and Robert Satcher, Jr. zoomed through morethan six hours of orbital work outside the station to install the large antennaand connect some new data cables. At times, they were two hours ahead ofschedule. Satcher, anorthopedic surgeon-turned-astronaut, also put his Earthly skills to work bygreasing up some snares that serve as grasping ?hands? on a Japanese roboticarm and a station attachment point. It was delicate work. ?We havephotographic evidence of the highest-recorded orthopedic surgery?ever,? jokedcrewmate Randy Bresnik, who choreographed the spacewalk from insideAtlantis. ?We know NASA didn?t just hire Bobby for his good looks.? Foreman andSatcher began their orbital work at 9:24 a.m. EST (1424 GMT), but swiftlytackled their main chore to move the hefty spare antenna from Atlantis? cargobay to a storage point on the station. ?What abeautiful view,? Satcher exclaimed as he began the first spacewalk of hiscareer while flying 220 miles (354 km) above Earth. ButForeman, a veteran spacewalker on his fourth excursion, had his eyes on hispartner. ?Hard tobelieve Bobby, but I think your feet look bigger from space,? he said. Theastronauts were so far ahead of schedule, they even managed to squeeze in anextra chore during the six-hour, 37-minute excursion. ?You guysare rocking the house,? Bresnik told the spacewalkers. For theextra task, they deployed a swing-out platform to hold even more spare stationgear in the future, but had to tackle some tough bolts in the process. In theend, Foreman had to bang on the bolt with a hammer while Satcher wiggled it tofree the stuck part. A small piece of debris, possibly part of a metal pin,drifted away during their exertions, but posed no risk to the station orshuttle, NASA officials said. ?You guysget the official MacGyver award for your work on that,? Bresnik said. Thursday?sspacewalk came one day after Atlantis arrivedat the station with six astronauts aboard. Theastronauts have already delivered one massive cargo carrier laden with otherspare parts - among them extra pumps, a gyroscope and tons of other gear. Asecond carrier will be installed later in the flight. Atlantis?11-day mission blasted off on Monday. It is largely a delivery run to stock thespace station with spare parts that can only be hauled by a NASA shuttle. NASA plansto retire its three remaining space shuttles by the end of next year and wantsto store as many spare parts on the station as possible to keep it runningthrough at least 2015, and possibly longer pending areview by the Obama administration. Thespacewalk was not the only high point in space Thursday. Mission Controlradioed the Atlantis crew to tell the astronauts they won?t have to takeanother look at their heat shield Friday after an inspection and photo surveyearlier this week found it to be in good shape. The crew will make a finalhealth check of the heat shield after leaving the station next week as astandard safety precaution. Americanastronaut Nicole Stott celebrated her 47th birthday aboard the space station todayas she prepares to return home next week aboard Atlantis. Stott has lived onthe station since late August and is looking forward to seeing her husband andson back on Earth. Bresnikalso has other things on his mind. His wife Rebecca is expected to give birthFriday to a baby girl, the couple?s second child, in Houston, Texas. MissionControl roused the crew with the song ?In Wonder? performed by The Newsboys, atune chosen for Bresnikby his wife. ?Thanks to mywonderful wife Rebecca for that song and the wonder of creation that's going oninside of her and what's going to happen tomorrow,? Bresnik radioed Mission Control.